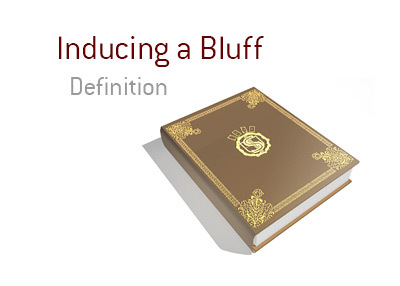 What does the term "bluff induce" mean in the world of poker? What is the definition of the term "inducing a bluff"? In poker, inducing a bluff occurs when a player with a very strong hand acts very strongly in order to try to get a player with a lesser holding to commit chips to the pot. For instance - let's say that you have been dealt pocket Aces. With the board reading A-A-Q-9-2, you overbet the pot on the river. Prior to the river card being dealt, there were 40,000 chips in the pot, and you decide to slide in 90,000 chips on the river. You have cultivated an image as being somebody who is very aggressive, so you decide to use this to your advantage to try and give the impression that you are bluffing the pot. You are hoping that your opponent has something like a pair of Queens and decides to call, thinking that you are bluffing. In actuality, you will be holding the nuts. If you are tight/aggressive, inducing a bluff will almost certainly not work. The odds of this working increase dramatically the looser your image is. In addition, strong players will sniff out your bluff more often than not, based on a read or the image that you have cultivated. Inducing a bluff certainly works better on amateur players.